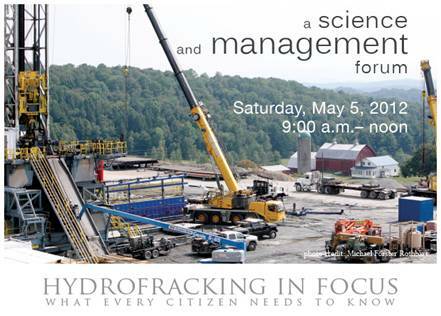 On Saturday, May 5th from 9AM to 12PM the Cary Institute of Ecosystem Studies in Millbrook is hosting a special forum exploring hydrofracking. Speakers on the panel will include industry and scientific representatives including several speakers from Pennsylvania where hydrofracking in the Marcellus Shale is currently underway. One speaker sits on the peer-review panel for the EPA’s hydrofracking study. I've been on the front lines covering the fracking issue and co-organized a panel called the Future of Gas Drilling in New York State at SUNY New Paltz in Spring, 2010. We took some flack from a few zealous anti-fracking advocates for inviting a senior rep from Chesapeake Energy, a big player in fracking around the country including the Marcellus Shale Region in New York. Somehow, by inviting "the enemy", we were the enemy too. Interestingly, we also were criticized by pro-gas industry factions for inviting "so many" anti-fracking representatives such as Wes Gillingham from Catskill Mountainkeeper to be on the panel. We also invited maverick U.S. Congressman from New York, Maurice Hinchey, who delivered a keynote. Congressman Hinchey was one of the first elected officials to speak out against fracking. Notably, he shed light on the 2005 "Halliburton" loophole in Federal legislation which, incredulously, exempted gas companies from all environmental oversight with regards to fracking. Personally, I say invite both sides to debate this divisive issue because, in the end, light on the subject will reveal truth and the truth will win out. Confession: I am 100% against fracking. It's time we stop playing Russian roulette with our environment. Our clean energy future is being stymied by large gas and oil companies. They spend enormous amounts of money propagating the notion that we are not capable of economic success and fueling ourselves by any other way than with their dirty fossil fuels. Such greenwashing appears in the daily media. Tune in CNN, for example, to catch BP's media ads as they attempt to polish their tarnished image. There is currently a moratorium on hydrofracking in New York while a task force appointed by Governor Cuomo investigates the economic and environmental impacts of this drilling practice. A coalition of groups such as United For Action are actively trying to maintain the moratorium and outlaw fracking town by town via local legislative initiatives throughout New York. Topics to be covered at the Fracking Forum on May 5th at the Cary Institute include groundwater contamination, the treatment of fracking wastewater, human health effects, industry innovations and the social impact that rapid gas booms have on small communities. Please attend and have your voices heard. The Fracking Forum is FREE and OPEN TO THE PUBLIC. The event will be held in the Cary Institute’s auditorium which is located at 2801 Sharon Turnpike (Rte. 44) in Millbrook, New York. RSVP is required.